It's a common ship disposal method that salvages raw materials from old vessels for recycling, but what makes ship breaking so controversial? Ship breaking (or ship demolition) is a ship disposal method which involves the dismantling of ships for recycling. Steel and equipment is removed, sold and reused, maximising the lifetime use of extracted materials. The Costa Concordia was notably dismantled in this way and remains the world's most expensive maritime salvage operation (€1.5 billion). Ship breaking expenses alone totalled €100 million. What are Incoterms®? Discover why Incoterms® are so important for businesses and international trade negotiations. The dismantling of the Costa Concordia (time lapse). The method in which vessels are dismantled varies substantially between developed and developing countries. The main impetus of each technique are costs associated with labour and government regulations (i.e. the environment, health and safety). In developing countries, such as India and Bangladesh, ships are typically run ashore at speed during high tide, for easy access throughout the ship breaking process. Labour conditions are very poor, with workers exposed to a variety of risks (i.e. toxic chemicals, fire, falling materials, radiation, electric shocks, etc.). For these reasons, ship breaking is considered one of the world's most dangerous occupations and highly damaging to the environment. 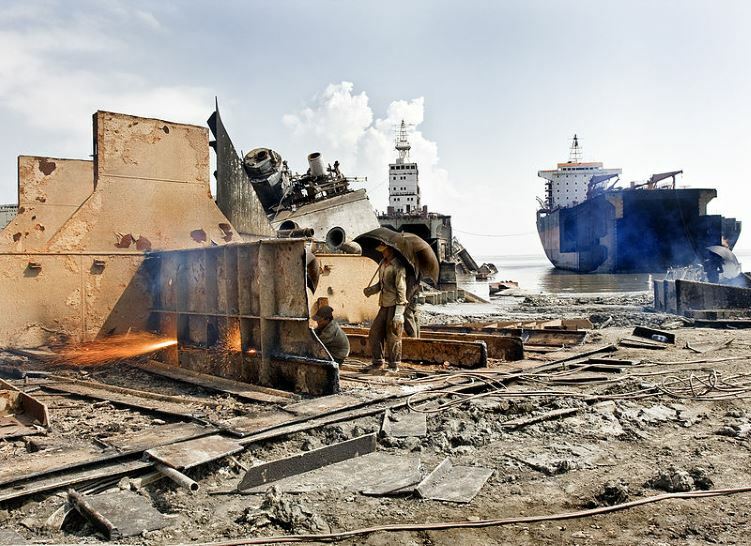 Conversely, in developed countries, ship breaking activities are usually conducted at a pier or dry dock, where hazardous materials can be catalogued and securely removed using environmentally responsible methods. Weighing in excess of 26,433 tonnes, watch what happens when a 169.6 metre cross-channel ferry arrives at one of the world's largest ship breaking yards in Aliaga, Turkey. Originally named the MS Pride of Calais, the MS Ostend Spirit operated from 1987 to 2013 when it was eventually withdrawn from service and sold for scrap metal.